For example, one dealer offered a slabbed, 50-piece set of classic, silver commemoratives. From the PCGS site, they describe this type of set as, "The 50-piece silver commemorative set includes one coin of each type of commemorative issued from 1892 through 1954. This highly collected series is often put together in gem condition (MS65/better) and many collectors seek out coins with attractive toning to build their set around. The set includes 48 half dollars, one quarter, and one dollar. Key issues are the Lafayette dollar, Isabella quarter, Hawaii, Sesqui, Monroe, and other coins, depending on condition and mintage." In slabbed condition, this 50-piece set gleamed with beautiful coins. 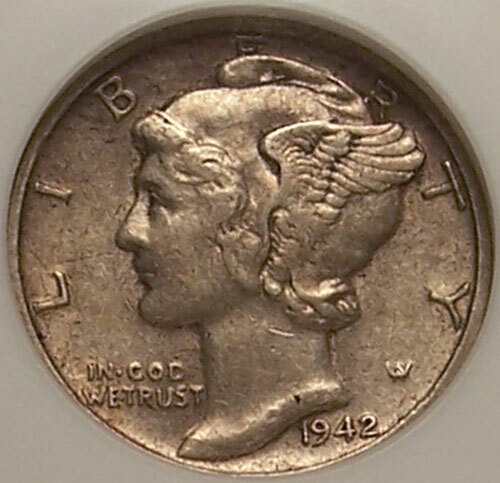 Another, not-so-common-to-the-bourse coin was the 1942 over 1941 Mercury Dime. To save money, engraving and metal, the mint chose to reuse the 1941 die. You can see the faint "nubs" in this picture of a 1942 over 41 dime. Not to be outdone by a dime, a 1909s Indian Cent graced the bourse as well. Per PCGS Coinfacts, "The 1909-S Indian Head Cent has THE lowest mintage of the entire series (at 309,000 pieces, the mintage is less than half that of the revered 1877 Indian Head Cent). Collectors love this date not only for its rarity but because it is one of only two dates struck at the San Francisco Mint (the other being the 1908-S). 1909 was the last year of production for the Indian Head Cent and fore-sighted collectors saved many nice examples, thus keeping the price of Uncirculated examples reasonable relative to their rarity. Many counterfeit examples of this date exist, so certification is a must." Of course, people also browsed the bourse for gold. In particular, they searched for American Gold Eagles and Canadian Gold Maple Leafs. For an interesting exercise, take a look at this site to see the gold (and silver) prices side-by-side: Monex Liveprices. We hope you visited and got to see the many different coins and collectibles offered at the coin show this month. If not, plan to come to the next show on March 14, 2010. New faces joined us this month. Some became awestruck as they entered and saw the size of the bourse, the number of dealers and the quantity of guests. All were welcome. Once again this month, the coin show and North Atlanta Sports Collectibles Show shared their Sunday date at the Holiday Inn Select. People easily moved back and forth between the two shows. Plus, people from the coin show walked over to get a glimpse of and meet Otis Nixon, the former Atlanta Brave, who was autographing his new book, Keeping It Real. Also this month, several of our regular dealers had conflicts - some personal and some business. As a result, the coin show invited a couple of new dealers to join the bourse. Welcome to you, and we hope you had a good show. As for coins, many interesting coins occupied the dealers' tables with a few out-of-the-ordinary. What a show. Four inches of snow fell in the metro area on Friday evening into Saturday morning then 50+ degrees for the show on Sunday. Wasn't the snow beautiful? Instead of the dangerous ice storms metro Atlanta normally experiences, the heavy, wet snow blanketed the area late on a Friday and began melting by midday Saturday. It almost looks like an apple tree in full, springtime bloom. 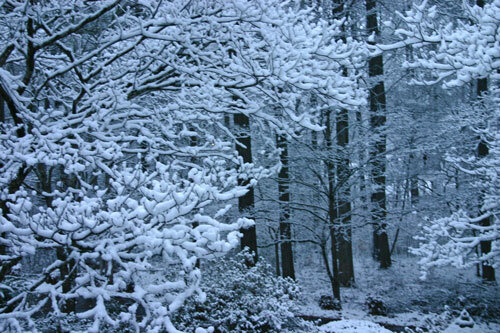 In reality, it's a dogwood with the snow "cotton balls" in all of its branches. For the coin show, Sunday's weather included an overcast day with temperatures reaching the low 50s and a few intermittent blue skies throughout the day. Neither the weather nor the sweetheart day kept people away. Once again, lots of people browsed the bourse and enjoyed the deals being offered. Welcome to all and thank you for coming!